There are tons of places in the house where clutter can build up. Closets are a good example of this, cleaning them out after years of build-up is never fun. Garages, too, can be a real nightmare to organize. We've come across many examples of boxes being crammed into a corner, rarely used machinery, and junk hidden away in garages. If you've decided it's time to address the chaos in yours, read on for our advice and strategic tips for approaching this. Consider your garage as quadrants. For example, you could start one wall at a time, take a break, and then move onto the next one. This will make the job a lot more manageable. It doesn't have to be a process that's entirely one clean sweep, either. Consider breaking things up into blocks of time to reduce stress (and boredom). A magnetic toolbar can do a lot of cool things like attract metal. “Duh”, you may say, but did you ever think about using a magnetic strip to hold various metal attachments to power tools? This goes for things like drill bits, sockets, and screwdriver heads. It's a really useful storage solution! Some of your food probably comes packaged in cans. Why not make further use of these containers once used by storing pens, brushes, pencils, screws and more in them. You can even hang them on the wall save space. This is great for small stuff that floats around and can easily get lost. It's also super cheap! This is a traditional method to reduce clutter: sell the stuff you don't need! Many cities have particular days for garage sales, so why not take advantage of this? Clearing out the stuff you don't need will also serve as a head start when it comes to organizing your garage. You could also even make a pretty penny with items you no longer need. Remember one person's trash is another's treasure! When working on the sections of your garage, tackle the big stuff first. The bulky stuff is what takes up a lot of room and typically gets in the way of other smaller items, making the job harder. You could even invite some friends over to help clean - if they find something you don't want, let them keep it, it's a good incentive! 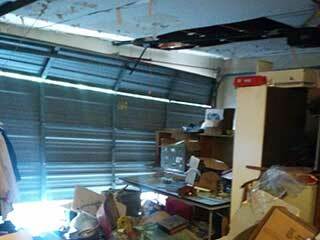 Chemicals are dangerous and definitely shouldn't be stored in a leaky, poorly insulated garage. If a significant leak were to occur, different materials could potentially mix, triggering a chemical fire. Additionally, your garage isn't usually as climate controlled as the rest of your house, so be sure to put chemicals in a safe, more temperate location.